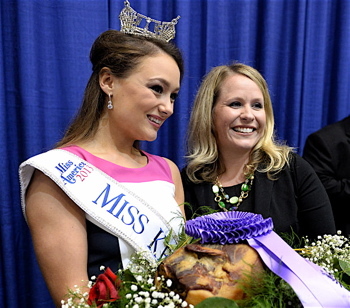 Miss Kentucky Jenna Day, and Angela Osting posed with the grand champion ham following the 50th annual Kentucky Farm Bureau Country Ham Breakfast. Osting, representing the Yum! Brands Foundation, placed the winning bid of $350,000. The Kentucky State Fair may have concluded a week ago, but the reverberations from the rhetorical stiff-arms thrown over healthcare reform by Governor Steve Beshear and Sen. Mitch McConnell at the Kentucky Farm Bureau’s Country Ham Breakfast continue to be felt around the Bluegrass. You see Kentucky is an odd duck of sorts. On one hand it’s one of the most conservative states in the union. It voted for Bush senior over Clinton, went for W in record numbers both times, and sided with McCain and Romney over Obama. Its senior senator is Mitch McConnell, Senate Minority Leader and highest-ranking Republican in the country. Kentucky’s junior senator is Rand Paul, who is a Tea Party loyalist and openly critical of the passage of the Voting Rights and Civil Rights Acts. Five of Kentucky’s six U.S. House members are Republicans as well, making this an extremely red state nationally, but the governor, Steve Beshear, is a two-term Democrat. He is a conservative Democrat, no doubt, and continues to throw his support behind the right-leaning coal industry in Kentucky even as its profitability decreases, but Beshear doubled down on healthcare reform. Kentucky ranks near the bottom nationally in terms of healthy states, coming in at 44. It ranks first in cancer deaths and smoking. Obesity, diabetes and heart disease are all a close second. Like its political makeup, Kentucky also has an ironic twist in the level of care accessible to its needy residents. Louisville is home to Humana, Inc., a Fortune 100 company and leading issuer of health coverage. The research hospitals at the University of Kentucky and University of Louisville are some of the best in the country. This state is recognized for its treatment of cancer and heart disease, but it’s a poor state, that has 640,000 residents lacking health insurance, so they can’t see any of the fine doctors here. Beshear realized he could cut all the operating costs he likes to try and shore up the state’s budget shortfall, but there was no way to fix Kentucky’s financial woes without addressing the rising costs of healthcare. The old way of providing care did not work. It was a never-ending pot of gold for doctors, administrators and insurers, but crippling as a prolonged business model. If you got sick policies were revoked. Then people were tagged with pre-existing conditions, forcing them to delay care and become even more ill before seeking care at emergency rooms where they couldn’t pay the bill – driving costs ever higher. The governor took it upon himself to embrace the Affordable Care Act passed by Congress and affirmed by the U.S. Supreme Court. His robust support has placed Kentucky at the leading edge of health reform by accepting President Obama’s invitation to have states set up their own state-based health exchanges. In Kentucky this marketplace is known as kynect, Kentucky’s Healthcare Connection, where people will be able to shop for low-cost health insurance. Beshear also opted to take advantage of expanding Medicaid, which will allow over 300,000 uninsured people to find coverage. Obviously in a state with such a conservative congressional delegation and red-leaning constituency, all this Obamacare love was not received with open arms. Usually the Country Ham Breakfast centers on agriculture, and the Farm Bill was discussed, but with open enrollment at the time 39 days away, it became a victim of circumstance. This just happened to be the spot where all the political players were in the same room, so the fight went down in a catered banquet room of South Wing B at the Kentucky Fair and Exposition Center. The sellout crowd of 1,600 at this 50th annual event was full of corporate big shots, agricultural leaders, university presidents, lobbyists, state lawmakers and congressmen. With Sen. McConnell stoically seated two chairs away, Gov. Beshear strongly defended his decision to aggressively implement the Affordable Care Act and to expand Medicaid. Being the crowd was split between Democrats and Republicans, about half the room burst into applause, while the other half sat on their hands. Implementing this new law “is not only the right and moral thing to do,” but it will provide an economic boon to Kentucky by creating 17,000 jobs with a positive economic impact of $15.6 billion. That ultimately will boost state revenues by a net of $800 million, said Beshear citing two independent studies that showed this information. “It’s amazing to me how people who are pouring time and money and energy into trying to repeal the Affordable Care Act sure haven’t put that kind of energy into trying to improve the health of Kentuckians. And think of the decades that they have had to make some kind of difference,” Beshear finished. McConnell didn’t take the criticism well, and said Obamacare is resulting in higher premiums and lost jobs as full-time employees are made part-timers. He also cited how UPS, Louisville’s largest private-sector employer, is limiting its healthcare plans for spouses. “So, governor, the solution to Obamacare is to pull it out, root and branch,” McConnell said to applause. McConnell’s Republican colleague, Sen. Rand Paul, a potential 2016 presidential candidate, also addressed the crowd, but gave a speech focused on controlling the national debt, ensuring the right to privacy and ending military aid to Egypt – though Paul did ask the crowd to consider “where’s the money coming from” to implement the program in Kentucky and across the nation. With the political barbs out of the way, it was time to move on to the main course, which was auctioning off a prized slab of pig. Harper’s Country Hams in Clinton, Ky., presented the fair’s Grand Champion ham on a platter, adorned with roses. It was showcased by the reigning Miss Kentucky, Jenna Day, who carried the platter among the bidders to give them a close look at the prized meat. This is a charity auction mind you, and bidding began at $1, but it quickly got serious, as the price soared into the six-figure range. The winning bid for this 13.3-pound ham was $350,000! The charitable wing of Louisville-based Yum! Brands Inc., (that’s the folks who own Taco Bell and KFC), placed the winning bid. It was the fifth-highest bid in the auction’s history. Proceeds from the auction go to the winning bidder’s charity of choice, which in this instance was the Fund for the Arts, which helps allow Kentucky children to see orchestra and theater performances. The ham was donated to a local food bank, Dare to Care. Can you imagine slicing up a ham that went for over $26,000 per pound?!? The Country Ham Breakfast is a uniquely Kentucky event, and a can’t miss date for the state’s movers and shakers. This entry was posted in News and tagged 50th annual Kentucky Farm Bureau Country Ham Breakfast. Bookmark the permalink.